How can I match metaproteomic mass spectrometry data to peptide sequences derived from shotgun metagenomic data? How can I perform taxonomy analysis and visualize metaproteomics data? How can I perform functional analysis on this metaproteomics data? A taxonomy and functional analysis of metaproteomic mass spectrometry data. In this metaproteomics tutorial we will identify expressed proteins from a complex bacterial community sample. For this MS/MS data will be matched to peptide sequences provided through a FASTA file. Metaproteomics is the large-scale characterization of the entire protein complement of environmental microbiota at a given point in time. It has the potential to unravel the mechanistic details of microbial interactions with the host / environment by analyzing the functional dynamics of the microbiome. In this tutorial, we will analyze a sample of sea water that was collected in August of 2013 from the Bering Strait chlorophyll maximum layer (7m depth, 65° 43.44″ N, 168° 57.42″ W). The data were originally published in May et al., 2016. There are three ways to upload your data. In this tutorial, we will get the data from Zenodo: . Import the three MGF MS/MS files and the FASTA sequence file from Zenodo. As default, Galaxy takes the link as name. The search database labelled FASTA_Bering_Strait_Trimmed_metapeptides_cRAP.FASTA is the input database that will be used to match MS/MS to peptide sequences via a sequence database search. 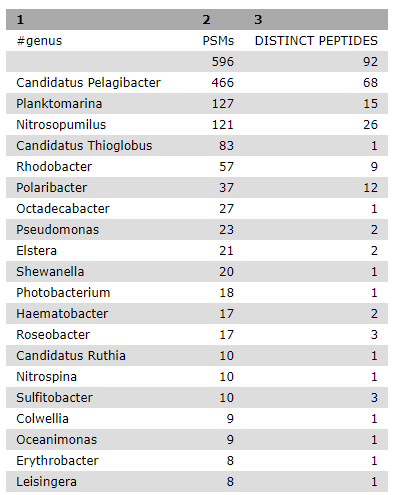 It is a small excerpt of the original database, which was constructed based on a metagenomic screening of the sea water samples (see May et al. (2016)). The full original database can be accessed from here. The contaminant database (cRAP) was merged with the original database. For this, the sequence database-searching program called SearchGUI will be used. The created dataset collection of the three MGF files in the history is used as the MS/MS input. Input Peak lists (mgf): MGF files dataset collection. The section Search Engine Options contains a selection of sequence database searching algorithms that are available in SearchGUI. Any combination of these programs can be used for generating PSMs from MS/MS data. For the purpose of this tutorial, X!Tandem we will be used. Note that sequence databases used for metaproteomics are usually much larger than the excerpt used in this tutorial. When using large databases, the peptide identification step can take much more time for computation. In metaproteomics, choosing the optimal database is a crucial step of your workflow, for further reading see Timmins-Schiffman et al (2017). To learn more about database construction in general, like integrating contaminant databases or using a decoy strategy for FDR searching, please consult our tutorial on Database Handling. There are a number of choices for different data files that can be generated using PeptideShaker. A compressed file can be made containing all information needed to view the results in the standalone PeptideShaker viewer. A mzidentML file can be created that contains all peptide sequence matching information and can be utilized by compatible downstream software. Other outputs are focused on the inferred proteins identified from the PSMs, as well as phosphorylation reports, relevant if a phosphoproteomics experiment has been undertaken. More detailed information on peptide inference using SearchGUI and PeptideShaker can be found in our tutorial on Peptide and Protein ID. Specify Contact Information for mzIdendML: You can leave the default dummy options for now, but feel free to enter custom contact information. The Certificate of Analysis provides details on all the parameters used by both SearchGUI and PeptideShaker in the analysis. This can be downloaded from the Galaxy instance to your local computer in a text file if desired. Scrolling towards left will show the sequence for the PSM that matched to these metapeptide entries. Column 3 is the sequence matched for each PSM entry. Every identified PSM is a new row in the tabular output. In the following steps of this tutorial, selected portions of this output will be extracted and used for analysis of the taxonomic make-up of the sample as well as the biochemical functions represented by the proteins identified. In the previous section, the genome sequencing and mass spectrometry data from processing of biological samples was used to identify peptides present in those samples. Now those peptides are used as evidence to infer which organisms are represented in the sample, and what biological functions those peptides and associated proteins suggest are occurring. 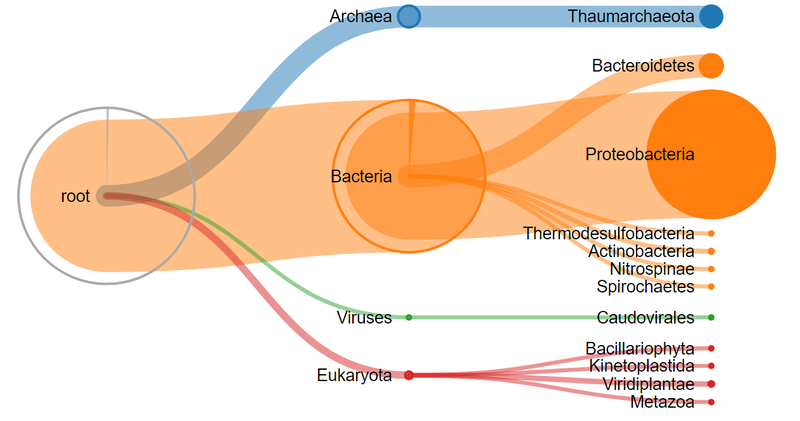 The UniProt organization collects and annotates all known proteins for organisms. A UniProt entry includes the protein amino acid sequence, the NCBI taxonomy, and any annotations about structure and function of the protein. The UniPept web resource developed by Ghent University will be used to match the sample peptides to proteins. UniPept indexes all Uniprot proteins and provides a fast matching algorithm for peptides. Users can access UniPept via a web page and paste peptide sequences into the search form to retrieve protein information. But we`ll use the Galaxy Unipept tool to automate the process. The Unipept tool sends the peptide list to the UniPept REST API service, then transforms the results into datasets that can be further analyzed or operated on within Galaxy. 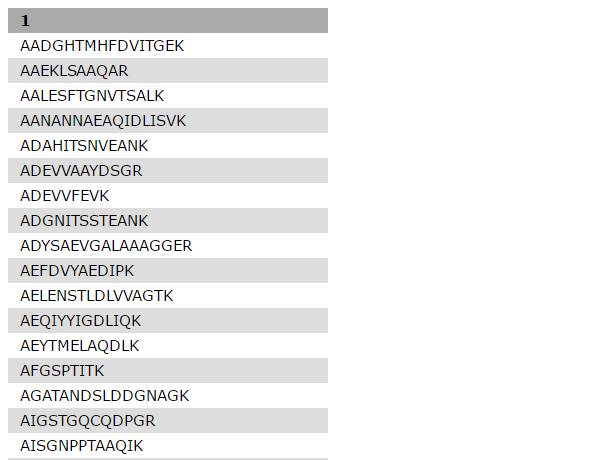 In order to use Unipept, a list containing the peptide sequences has to be generated. The tool Query Tabular can load tabular data (the PSM report in this case) into a SQLite data base. As a tabular file is being read, line filters may be applied and an SQL query can be performed. By default, table columns will be named: c1,c2,c3,…,cn (column names for a table must be unique). You can override the default names by entering a comma separated list of names, e.g. ,name1,,,name2 would rename the second and fifth columns. Check your input file to find the settings which best fits your needs. Query Tabular can also use an existing SQLite database. Activating Save the sqlite database in your history will store the created database in the history, allowing to reuse it directly. The SQL query might look confusing at first, but having a closer look should clarify a lot. What does FROM psm mean? What need to be changed if we only want peptides with a confidence higher then 98%? We want to read from table “psm”. We defined the name before in the “Specify Name for Table” option. SELECT sequence as "peptide", count(id) as "PSMs"
Click Execute. 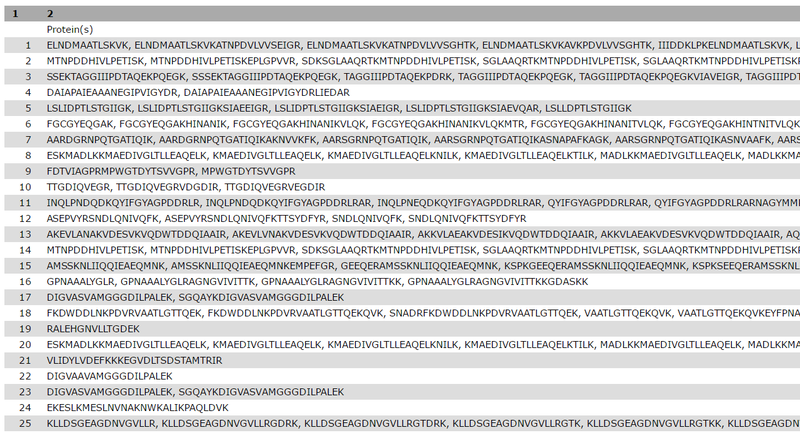 The resulting file should have two columns, one with the distinct peptides, the other with the count number of PSMs. Tabular Input Containing Peptide column: The query results file. Click Execute. The history should grow by two files. View each to see the difference. SELECT lca.genus,count(psm.sequence) as "PSMs",count(distinct psm.sequence) as "DISTINCT PEPTIDES"
Recent advances in microbiome research indicate that functional characterization via metaproteomics analysis has the potential to accurately measure the microbial response to perturbations. In particular, metaproteomics enables the estimation of the function of the microbial community based on expressed microbial proteome. In the following chapter, a functional analysis will be performed using the UniPept application pept2prot in order to match the list of peptides with the correlated Gene Ontology terms. This allows to get an insight of the biological process, the molecular function and the cellular component related to the sample data. pathways and larger processes made up of the activities of multiple gene products. For this tutorial, a tabular file containing the relevant GO terms has been created. It contains the GO aspect, the ID and the name. It is available at Zenodo: . Import the file Gene_Ontology_Terms.tabular from Zenodo. In the upload window of Galaxy you can set the filetype and related genome of the file you’re uploading in the corresponding columns beforehand. This might be handy if the automatic detection of the filetype didn’t work out perfectly or if you want to avoid setting the genome later on, especially for multiple files. The latest Gene Ontology can be downloaded here as a text file in the OBO format. OBO files are human-readable (in addition to machine-readable) and can be opened in any text editor. They contain more information than just the name and aspect. In order to receive a file like we use in the tutorial for your own analysis, different tools are available to extract information from OBO files, one of them being ONTO-PERL. An example file with all GO terms from 08.07.2017 named Gene_Ontology_Terms_full_07.08.2017.tabular can be found on the Zenodo repository of this tutorial as well. The UniPept application pept2prot can be used to return the list of proteins containing each peptide. The option retrieve extra information option is set to yes so that we retrieve Gene Ontology assignments (go_references) for each protein. Tabular Input Containing Peptide column: The first query results file. The output should be a tabular file containing a column labeled go_references. This is what we’re looking for. The UniPept result file can contain multiple GO IDs in a single row. In order to create a normalized table of this data, these rows will be split so each record contains only one GO ID. count(distinct bering_psms.sequence) as "bering_peptides", count(distinct bering_psms.id) as "bering_psms"
Repeat these steps two times by replacing molecular_function in the fifth row of the SQL query by biological_process and cellular_component. With these three output files the functional analysis of this tutorial is finished. Each record contains the name of a GO term, the amount of peptides related to it and the amount of PSMs for these peptides. This material is the result of a collaborative work. Thanks to the Galaxy Training Network and all the contributors ( Timothy J. Griffin, Pratik Jagtap, James Johnson, Clemens Blank)!